nj exit 12, bear left! after spending a good part of the summer in upstate ny, i saw a lot of wildlife, much different than the wildlife i see in the city. the one thing i was hoping to see and didn’t, was a bear. and i really wanted to see a bear. i’ve been spending time at my friend diane’s house in nj. she lives on 6 acres in the woods and her yard backs up to 40 more acres of wooded land. the other night around 9:00 pm, while relaxing in the living room with diane, her friend richie and her daughter, i thought i heard a car door close. when i asked if anyone else heard it, diane and her daughter instantly jumped up and yelled, “bear!” wasting no time, they ran to the garage and opened and closed the electronic doors to make noise which they hoped would scare the bear away. hoping to get a close up photo of the bear that i was still not convinced existed, i was holding my camera (which you may not be able to tell from the above rendering). i called for the bear several times before seeing a dark shadow moving slightly up in the woods to my right just a little bit. i wondered, if that’s the shadow, where is the actual bear creating the shadow? i looked harder into the woods, squinting and trying to focus into the dark woods. knowing that i was very close to this shadow and presumably, the bear, my body seemed to go into “survival” mode without the help of my brain because i became extremely nervous and began to get a bit shaky, but continued to watch the slow moving shadow 20′ away and call for the bear. i could hear diane screaming, “close the door! 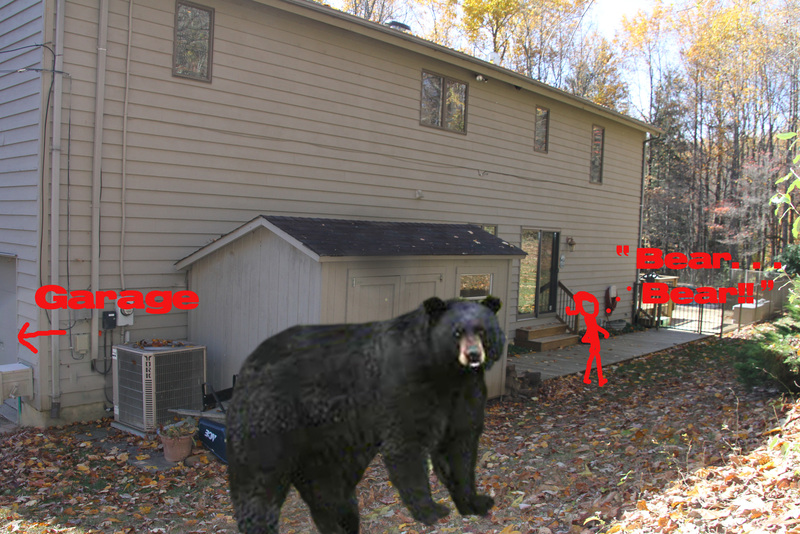 close the door!” when her words registered in my mind, i thought of the possibility that the bear had not run into the woods, but was still around the corner from me right in the driveway. this prompted me to look to my right at which point i realized the bear was in fact not in the driveway, but standing approximately 12 feet to the right of me. this was by far the biggest bear in america. rather than looking into the camera as he appears to be in this picture (that i lifted off the internet for obvious reasons), he was actually staring straight at me. eyeball to eyeball. his head was at least one foot higher than mine (i am 5′ 4″ tall). he was just standing there staring at me the whole time i had been calling him! i have seen a wild bear once before and i have never, ever, seen such a behemoth creature in all my life. 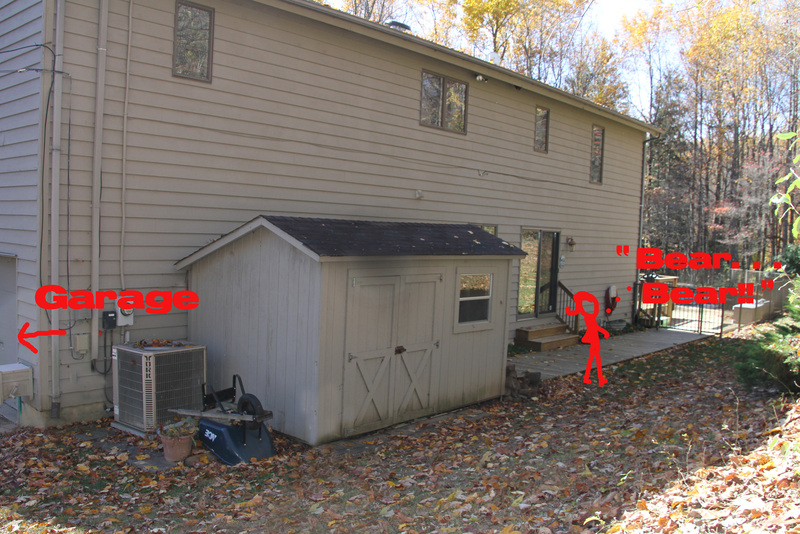 at a speed rivaling usain bolt, i flew into the house. it took the rest of the evening for all of us to calm down enough to switch subjects and think about anything else. diane had seen this same bear before and was relieved to know that now someone else had witnessed this particular guy, as she always thought that the people she told about ‘big bear,’ thought she may be exaggerating about his size. he was easily 900 lbs and the size of a small car. as you can probably imagine, it was a little nerve racking for me to take ivan out after dark from then on. for the next couple of nights we stayed close to the house. diane had her spot lights replaced and now the side yard can be lit up like wrigley field. i went into the kitchen and opened the blinds covering the sliding glass doors to see if anything would appear from the bushes. 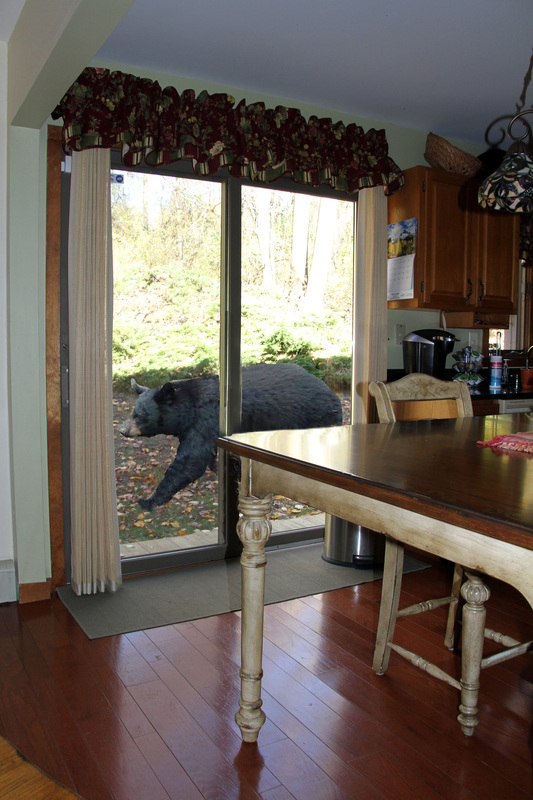 in the small grass area between the kitchen and the woods was a bear sauntering by and looking directly into the kitchen. he looked to be about 500 lbs. when the screaming began, he walked slowly into the woods . . .
i never understand why people are afraid of the city. really, it’s a much less dangerous place to be.